Similarly, the light crane systems offer easy adaptation to load and operating conditions. Available in four standard profile sizes, design modularity again provides users with the opportunity for light and easy assembly, the result of which is smooth movement of the reinforced crane bridge and optimal space utilization at low headroom conditions. Air delivery is facilitated via hose trolleys in the crane rail. To help maximize system life, users can pick from a range of surface protections for the crane rail and trolleys, including coated, zinc-plated or chromated, while stainless steel is available as an option for lighter capacities of 100 and 200kg. 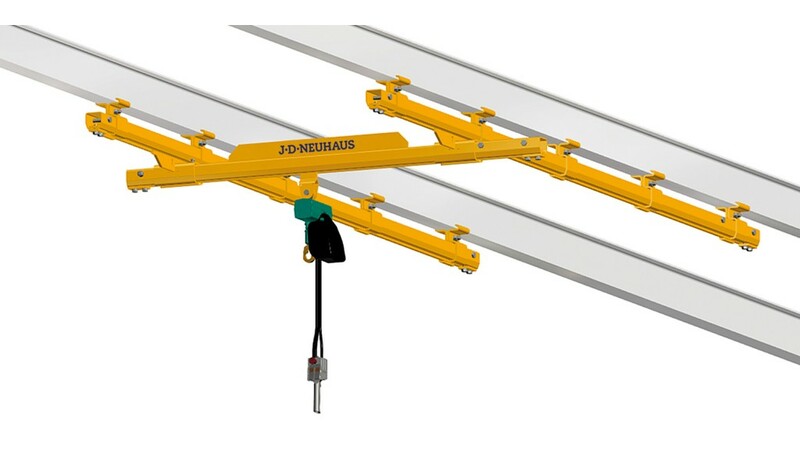 Both the light cranes and C rail/suspension tracks give provision for straightforward system extension to accommodate changing requirements over a working life. The crane track length is fully selectable in accordance with customer requirements, while the bridge length can be specified up to a maximum of 6000mm as standard, with larger sizes available upon request. Track width is dependent upon the bridge length, but typically, a system with a carrying capacity of 125kg would dictate a maximum track width of 4500mm. This rises to 5000mm for carrying capacities of 250, 500 and 980kg. The carrying capacities are of course determined by the choice of pneumatic hoist utilized. Here, JDN offers its mini 125, mini 250, mini 500 and mini 1000 models, which are not only offer lube-free operation for use in hazardous areas, but a price-competitive alternative in comparison with other types of powered hoist. CPC-Cryolab, a CIRCOR International brand, announces the Uniseal Cryogenic Stainless-Steel Pipe Coupling for the industrial gas, cryogenic, and space industries. Featuring a Spiral-Wound gasket instead of a ground joint finish, the Uniseal Cryogenic Stainless-Steel Pipe Coupling virtually eliminates leaks caused by poor mating surfaces. This coupling offers cost savings by reducing downtime and increasing the speed of recovery. The Uniseal Cryogenic Stainless-Steel Pipe Coupling is ideal for applications where valves, regulators, and the like require routine or frequent maintenance. With asset utilization critical and community and regulatory pressure always looming, it is essential that tank farm owners proactively prevent any loss of containment with reliable, cost effective corrosion protection. This is crucial since atmospheric corrosion is one of the main culprits of tank leaks, containment loss, and early replacement. Alcad, a manufacturer of nickel-technology battery solutions for industrial power backup, has supplied battery systems to form the heart of a solar-powered cathodic protection scheme at Qatar Petroleum's Dukhan Gas Field. Ritchie Bros.' latest solution for the market, RB Asset Solutions (rbassetsolutions.com), is a complete end-to-end asset management and disposition system. The new cloud-based SaaS solution brings together a suite of tools and services to help customers better manage, analyze, and sell their assets. From any internet-enabled device, customers will be able to access a complete inventory management system, data analytics and dashboards, branded e-commerce sites, and multiple external sales channels. Trimble announced that the Video Intelligence solution is now available for its Oil & Gas Services fleet customers. Video Intelligence brings together forward-facing cameras combined with an onboard event recorder (OER) to provide fleets a comprehensive view of their vehicles. SGS and Baker Hughes, a GE company, announced a Strategic Alliance Agreement (SAA) for the joint deployment and commercialization of BHGE's real-time software and sensor-based Predictive Corrosion Management (PCM) solution. Leveraging the capability of the Industrial Internet of Things (IIoT), PCM will enable asset owners to increase their ability to monitor their facilities, and detect and predict corrosion issues using real-time data powered by BHGE's ultrasonic sensing technology and advanced analytics. Connected logistics startup LoadDocs is tackling one of the oilfield service industry's most vexing daily challenges: completing paperwork in the field. The discussion about climate change has been taking place for many years and is still a hot topic, now more than ever before. This debate has led to global initiatives to reduce carbon footprints, which is high on the agenda of almost every country's government. Regulations on a global, regional and local scale have been established to reduce greenhouse gas emissions, which heavily impacts the oil & gas industry. To achieve those goals and prove regulatory compliance, the industry is rapidly adopting the ISO 50001 standard to improve the organization's energy performance and make climate part of their corporate strategy. Trelleborg Sealing Solutions announces the launch of the new polytetrafluoroethylene (PTFE) based O-Ring energized single-acting rotary seal, Turcon Roto Glyd Ring DXL. This seal is specifically designed to meet the demands of high pressure rotary applications within the oil and gas industry. Dover announced that its "Wellsite" upstream energy businesses will be named Apergy. Apergy will be a publicly traded company headquartered in The Woodlands, Texas with the tagline: "Unlocking Energy." The spin-off transaction is on track for completion in May of 2018, subject to the satisfaction or waiver of certain customary conditions. The MIZ-21C from Zetec Inc. is the first truly affordable handheld eddy current instrument with surface array capabilities, according to the manufacturer. Jacobs Engineering Group Inc. has received a five-year contract renewal from Shell Canada Limited to provide mechanical maintenance and turnaround services on the company's Scotford site located in Fort Saskatchewan, Alberta, Canada. Employing approximately 300 full-time personnel on the site, Jacobs will continue to provide mechanical maintenance and turnaround services for the full facility. Cyberhawk Innovations, a leader in aerial inspection and survey using unmanned aerial vehicles (UAVs), has been appointed by the Engineering Construction Industry Training Board (ECITB) to develop the UK's first industrial training syllabus for drones in the engineering and construction sectors. ExxonMobil Upstream Research Company announced that it has signed a three-year joint development agreement with MagnaBond, LLC to develop new technologies that could enhance cost-effective evaluation of well cementing, casing and tubing. The agreement was facilitated by the Industry Technology Facilitator as part of its initiative to address challenges associated with well decommissioning activities such as plugging and abandonment. Trelleborg Sealing Solutions has expanded its HiMod Slydring HC wear ring range, introducing over 180 additional part numbers in outer diameters from 1 to 12 inches. The enhanced range becomes available early 2018, serving various fluid power applications including industrial machines, mobile hydraulics and other industries. Leaking flange? Don't shut down — contain it and divert it with the Xtreme Shell manufactured by Andax Industries. Pure Technologies Ltd. has entered into a definitive arrangement agreement with Xylem Inc. whereby Xylem will acquire all of the issued and outstanding shares of Pure for CAD $9.00 per share in cash, representing an enterprise value for Pure of CAD $509 million. NACE International Institute is proud to announce the release of its innovative IMPACT PLUS corrosion management product - the world's first platform to benchmark practices and improve corrosion management. This one-of-a-kind platform is designed to advance corrosion management performance across all industry sectors, from pipelines and bridges to maritime and defense systems, and beyond. Built as a tool for management professionals, the program balances technical and business solutions by utilizing process classification frameworks, maturity models and benchmarking expertise. In the oil and gas industry, protecting massive carbon steel assets from corrosion is a continual challenge around the world, including China, particularly along coastline exposed to high humidity and salty air near oceans or other bodies of water. LUX Assure, a specialist in the provision of chemical monitoring and management solutions to the oil and gas industry, has launched TraxBio, a world first in biocide mapping. With its big October auction in Edmonton last week, Ritchie Bros. sold more than 6,800 equipment items and trucks for CA$94+ million (US$73+ million). The four-day event held October 24 - 27, 2017, attracted more than 9,850 bidders from 47 countries, including 7,300+ online bidders. IronPlanet customers now able to finance through Ritchie Bros.
Ritchie Bros. Financial Services (RBFS) is expanding its reach, now serving as a preferred provider for IronPlanet, a leading online marketplace for used equipment and other durable assets. Edmonton auction proving popular for Ritchie Bros.
As seasons change so do equipment fleets for many companies. Summer work is done, winter work is on its way; making October the perfect time to upgrade your gear. Keyera Corp. has entered into a 20-year midstream agreement with Chevron Canada Limited to fractionate and handle natural gas liquids from Chevron's Kaybob Duvernay operations near Fox Creek, Alberta. The Agreement includes an area of dedication that is in excess of 230,000 gross operated acres and also includes take-or-pay commitments. Under the terms of the Agreement, Chevron will deliver approximately 50% of its natural gas liquids from the area of dedication to Keyera for fractionation, storage and terminalling services on a fee-for-service basis. Texo Drone Survey and Inspection (UKCS), the dedicated Oil & Gas services division of Texo DSI - owner-operator of the world's most comprehensive and dynamic fleet of unmanned aerial vehicles - is pleased to announce the deployment of the world's first UT (Ultrasonic Thickness Testing) integrated UAV system. With an expanding educational portfolio, Lincoln Electric has consolidated its education products, services and resources into one convenient website. This new site provides students, educators, corporate trainers and design engineers with a common interface and access to leading welding education information and products. A new UK-based technology company will premier a number of safe, unique and innovative asset survey & inspection applications for the oil and gas industry at the Offshore Europe conference and exhibition in Aberdeen next week. Bluestream, a provider of innovative inspection services to the oil, gas and wind industry, and Skeye BV from Alphen aan den Rijn, one of the most successful UAV operators in the Netherlands and UK, have announced a partnership providing visual inspection services and geographic data acquisition for offshore assets using unmanned aerial vehicles (UAV). Ensuring your Tungsten Electrode is sharpened correctly can help to improve weld quality. Tungsten Electrode Grinders are a convenient, safer and accurate way than other methods of grinding Tungsten Electrodes.